Scud and Sussudio make another one-shot stop in this fourth installment of the HORSE series. This time, they're plunged into the plot of a 1980's teenage slasher film. 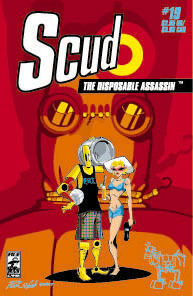 See Scud battle an invincible psycho, get high and play volleyball. See Sussudio wear a bikini, get high and watch Scud play volleyball. See people dying, improvisational weaponry and women taking showers for no good reason. All to the suggested soundtrack featuring Pink Floyd, Duran Duran and Herbie Hancock.